Part of the Great Lakes Megalopolis, Cleveland is the largest metro in Ohio. Home to multiple Fortune 100 HQs including Goodyear, KeyCorp, & Progressive and over 28 institutions of higher education. NASA’s Glenn Research Center, Case Western Reserve University, the Cleveland Clinic, and the University Hospitals of Cleveland all contribute to making Cleveland a center for innovation and opportunity. The city of Cleveland has been an active promoter of technological growth in the vibrant CBD (central business district). There are number of in-metro high speed optical networks that allow for some exciting connectivity options. 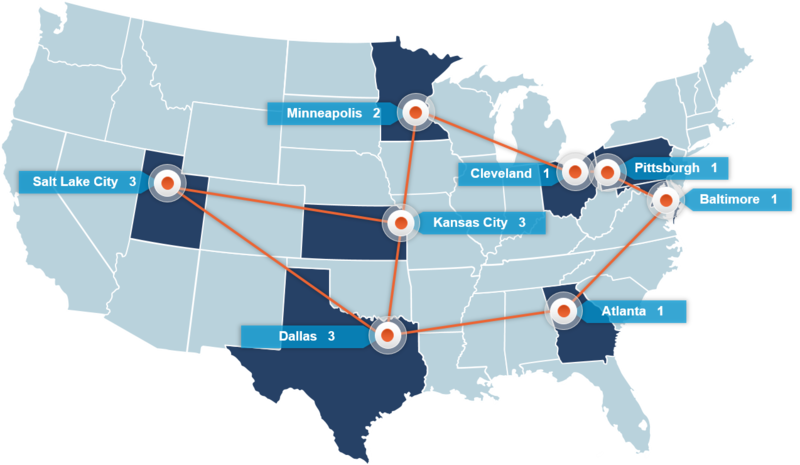 DataBank’s downtown Cleveland facility is located in the newly renovated Euclid corridor, home to the nation’s first commercially available 100 Gigabit fiber network. With onsite direct connectivity to numerous world-class network carriers and partners, the data center offers a multitude of cross-connection and peering options with 100% uptime SLAs. DataBank offers a full range of connectivity methods across the nation to achieve our customers goals. This includes a national IP transport service which provides inter-region and intra-metro connectivity. Our carrier neutral facilities offer robust interconnectivity and high-bandwith access to top-tier carriers. This results in a resilient communication environment across multiple DataBank sites.